<i>Columbo</i>: A Follow-up to Alfred Hitchcock Presents? Columbo: A Follow-up to Alfred Hitchcock Presents? Just one more thing, 1968. 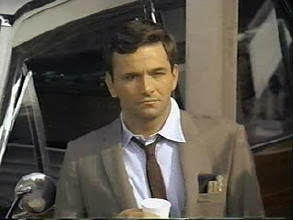 I'm not quite old enough to remember when Peter Falk, as Columbo, first began catching-up criminal masterminds in his 1968 made-for-TV movie debut. I caught up with him some time in the mid-70s. And while later it would be a shock to see that he'd become an old man, now, having just watched his first crack at the role, it's a surprise to see the detective as a babyfaced 30-something. A young Columbo? It almost seems like an oxymoron. To me he will always be a rumpled knot of middle-aged absentmindedness. What got me curious about revisiting Columbo, which ran from 1971 to 1978, was a recent discussion on my Facebook page. Fellow Hitchcock geek TriFer had been musing about what Hitch might have thought of the TV show because 'the stories and how they're presented are essentially copies of Dial M for Murder and because a lot of Hitchcock's stars appeared in it.' Annabelle's enthusiastic remarks also prompted me to check it out. After watching his debut movie, Prescription: Murder—a "perfect murder" story about a wealthy psychiatrist who kills his wife—all sorts of Hitchcockian overtones jumped out at me: the sophisticated Dial M approach, the cat-and-mouse game played between detective and killer that's reminiscent of Rope, the psychological gamesmanship. Even several shots came right out of the Hitchcock playbook, such as the use of long corridors with deep perspective to heighten the emotional impact of a scene. This is wildly speculative and surely erroneous, but I'd like to point out a similarity between the genius Columbo's reliance on his never-seen wife and Hitch's devotion to the all-but-invisible Alma. I'm not saying, I'm just saying. But that Facebook discussion got me thinking. What did Hitch think of Columbo? We might never know. But it is worth noting that the original TV movie and subsequent series were Universal Studios productions—a business concern in which he had an enormous financial stake. (The studio was wholly owned by MCA, of which Hitch was its third-largest shareholder.) It's likely that Hitch knew Columbo very well. A thumbs up from him might have decided its future. Like Alfred Hitchcock Presents, Columbo also showcased up-and-coming talent. This is quality stuff. You can stream it on Amazon in HD (free, if you're "Prime"). (Disclaimer: this is not a paid plug.) As such, it's easy to imagine that Columbo helped fill the space left open when the Alfred Hitchcock Hour finished its run in 1965. But first things first: watch the original TV movie and see how Columbo was originally cast as a younger man. Then, for a treat, watch episode two, "Murder by the Book," to check out the directorial chops of 25-year-old Steven Spielberg! Just to expand the comparison a bit, a comparison of Columbo to some of Hitchcock's movies. 1.) In Columbo his wife acts as a distraction preventing him from becoming too one track, much as Pamela distracts Hannay in The 39 Steps. Pamela is slated to become Hannay's wife at the end of the film. 2. The use of hollwness and emptiness as theme. In North by Northwest, The O in Roger O. Thorndike stands for nothing. The McGuffin a statuette to transport state secrets is hollow. Columbo's name apparently is Lieutenant, his pet is named Dog, and his wife is nameless. 3. Both Hitchcock and Columbo celebrate the Everyman who can rise to genius status, given the proper inspiration. Given the proper love interest (or pet), the dog Dog actually not only takes a passive role, but sometimes is useful to solving the case when Columbo becomes too dogmatic. The reason a murdered dog in Rear Window leads to digging up a flower bed which contains Raymond Burr's wife's head, with the rest of her put in the quaint vernacular of Thelma Ritter, "All Over Town."